With the Deutsche Bahn you can approach the main train station Eisenach. From there you can take the Bus 10 to Wartburg Eisenach and then have a 6 minute walk to the castle. You can approach the Wartburg castle through the B19 Wartburgallee. There is a parking opportunity under the castle, from there you have to walk approximately 500 meters to the castle. For the elderly and handicapped visitors, there is a shuttle bus from the parking lot to the castle. The Wartburg castle and its museum remember today their former, famous residents. Martin Luther translated the New Testament in the Wartburg castle. Since 1999 it's on the UNESCO World Heritage list. The Landgrave's headquarters was once regarded as the center of high medievel poetry and minnesong. Over time it became the residence of St. Elizabeth, offered the persecuted by the Pope and the Emperor, such as the reformer Martin Luther exile. With a great collection of Reformation pamphlets, one of Luthers handwritten annotated Bible, various items from his posseson and unique Cranach portraits are available for visitors to see at the Wartburg castle and its museum. The Historical Christmas market at the Wartbug castle, enables its visitors the world of historical trading and honored almost forgotten crafts. There is a romantic atmosphere right before and during the Christmas time. There is a speciality in Wartburg. Canoeing on the River Werra. Water walking is fun for young and old. You can rent a boat and upon request you will be brought back to the starting point or paddling down the river and cycle back on the Werra Cycle route. 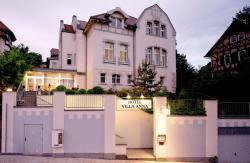 Located at the foot of the Wartburg mountain in the city of Eisenach, this elegant 4-star hotel features a beautiful Art Nouveau façade with a colourful, modern interior design. This 4-star hotel is located in the historic Storchenturm Tower in the heart of Eisenach, just 100 metres from the Market Square. It offers rooms with satellite TV.